Library History - Don't Bury the Library! From the Santa Cruz Public Library website. The history of the Downtown Branch library begins in 1903 when it became the first of four Carnegie funded libraries that were built in Santa Cruz. All four of these buildings were designed by noted California architect William H. Weeks. Click HERE to read the history of the original downtown library. The Downtown Branch, which was known as the "Carnegie Library," received a $20,000 grant of Carnegie funds, and the cornerstone was laid on September 29, 1903. On April 14, 1904, the new Carnegie Library of Santa Cruz, at the corner of Church and Center Streets, was formally opened with the appropriate ceremonies. The new building had two floors, with a total of about 9,000 square feet. The book collection was around 14,000 volumes and served a population of 10,000. By 1953 though, the building was considered to be too small, and on November 3, 1964, a library bond measure to construct a new building finally passed. In April, 1965, the architectural firm of Spencer, Lee, and Busse of San Francisco was chosen to design the new building, with final building plans approved by the City Council on July 13, 1966. 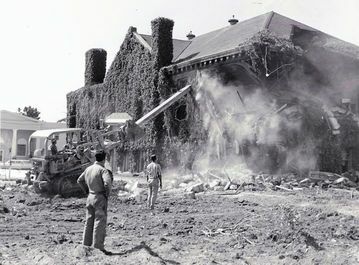 Arthur Brothers, Inc., of San Mateo was chosen for construction of the new building, and the old Carnegie Library was demolished in September 1966. Over the intervening years, the current building has undergone a number of major renovation projects: floor plan changes, staff moves, new carpeting, lighting, and wiring, painting, landscaping, and several asbestos abatement projects, are some examples. The building withstood the 7.1 magnitude Loma Prieta earthquake of October 17, 1989 without any structural damage, but serious damage occurred to shelving on the first and second floors. The Downtown Branch contains the largest collection of any branch in the library system, with over 215,000 items, and includes a California History and Genealogy Room used extensively by a number of researchers. The cornerstone of the original Carnegie Library can still be seen in the landscaped area at the corner of Church and Center Streets.